Elsewhere this has been called “the grand obligation.” The reason that we exist is to know, appreciate, worship, serve and enjoy the God of glory. In other words, to glorify God and to enjoy him are not separate activities. The way that we glorify God is by enjoying him. Tim has been very clear that this isn’t just a book about God or the Trinity. It’s not a systematic theology which might leave us feeling weighed down and confused. Instead, it’s a ‘how to’ book exploring how we relate to and enjoy God – Father, Son and Holy Spirit. The reality, however is that that this book is both theologically rich and very practical. It contains wonderful descriptions of the Trinity, but these are presented in a way which makes the truth clear and accessible. Essentially, he achieves something quite special. He shows us who God is, why we ought to enjoy him and how to go about it. And so, if you want a book which will give you a clear understanding of how Father, Son and Holy Spirit relate to every believer every day, then this one is for you. 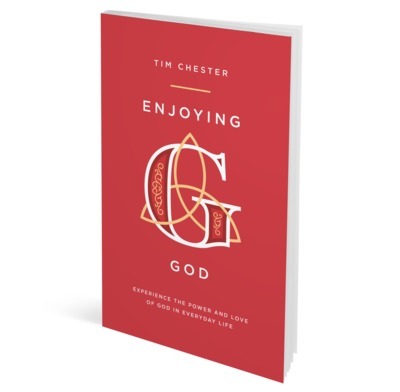 If you want a book which will give you a deeper appreciation of our great God, then this one is for you. If you want a book which is full of practical examples and concrete illustrations, then this one is for you. If you want to pursue your ‘chief end’ wholeheartedly, then this one is for you. And that’s why we’re suggesting that everyone taking part in the Media Fast next week (4th – 8th February) grabs a copy ASAP. It’ll be a wonderful way to spend some of that extra time. You won’t regret it.